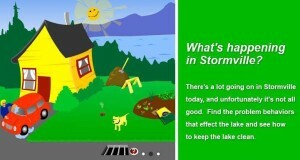 Stormville is an interactive web application developed by the Regional Stormwater Education Program to educate residents on stormwater best practices for their home. An informed and knowledgeable public is critical to the success of any stormwater management program. An informed citizenry helps ensure greater support for stormwater programs and can also improve water quality by encouraging property owners to take responsibility for what happens on their property. Stormwater permit requirements for MS4 communities in Chittenden County require that each town conduct education and outreach for it’s residents. A single community working on its own may be limited in its ability to create a coherent and far reaching educational campaign. In addition, adjacent communities may provide different messages which could serve to confuse the public. The Chittenden County Regional Stormwater Education Program (RSEP) was formed in 2003 to educate residents on ways that they can reduce stormwater pollution to local streams and Lake Champlain. The RSEP program maintains a website at www.smartwaterways.org. RSEP uses this website in conjunction with television, radio, and print ads to distribute messages linked to specific stormwater problems. These problems include topics such as proper pet waste disposal, minimizing debris from home construction projects, proper disposal of toxic chemicals, best practices for vehicle and equipment washing, and over fertilization of lawns and gardens. In addition to the multi-channel media campaign, educational events hosted throughout Chittenden County also raise awareness and encourage positive behavior change in residents. The implementation of a regional stormwater education program has many benefits. By combining efforts, the Chittenden County municipalities are able to pool their resources to create a more robust program that provides a consistent message to the public. A summary of the RSEP’s measurable benefits (e.g. web site visitors) are included in the MS4 annual report that the City submits to the Vermont Department of Environmental Conservation (DEC). Copies of these reports are available on our Downloads page. In addition, in 2013 RSEP conducted a survey to measure the public’s awareness and understanding of various stormwater issues versus awareness and understanding of these same topics in 2008. The survey showed that outreach efforts were having a positive impact. Additional surveys are planned for the future. The RSEP program has been in effect since 2003. The City of South Burlington contributes $5,000 per year to the RSEP program.